An ultra-lite viscosity racing oil for small to medium displacement engines. Excellent drag race and motorcycle sprint racing oil. The Royal Purple XPR (Extreme Performance Racing) synthetic motor oils are specifically formulated for the demands of multi-platform racing environments. This has been achieved using the highest quality synthetic base oil combined with Royal Purple’s proprietary Synerlec additive technology and additional performance enhancers. XPR synthetic motor oil provides the highest level of protection against motorsports-grade heat and wear, more than leading conventional lubricants and synthetics even when they are combined with aftermarket additives. 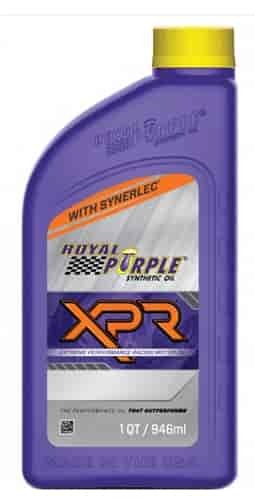 Royal Purple XPR oils are popular in many racing disciplines including NHRA, NASCAR, Stadium Super Trucks, Bonneville Salt Flats Land Speed Runs, Standing Mile Competitions, and World of Outlaws. Professional race teams and engine builders and race teams use Royal Purple to increase engine life and to maximize horsepower and torque. An ultra-lite viscosity racing oil for small to medium displacement engines. Excellent drag racing and motorcycle sprint racing oil. Formulated to withstand exotic fuels including alcohol, methanol, and nitrous oxide (NO2). Excellent drag racing oil. Capable of withstanding long intervals of extreme heat and it works especially well with alcohol and methanol. Designed for marine, sprint cars, late models, endurance car racing and street hot rod engines. Formulated for sprint cars, late models, marine, and big block bracket racing. Ideal for any high output racing application under extreme heat and pressure conditions for an extended period of time. Formulated specifically to increase torque and horsepower in race-modified high-performance engines. Excellent for rallycross and endurance road racing. 01009 - Royal Purple XPR Extreme Performance Synthetic Racing Oil is rated 5.0 out of 5 by 1. Rated 5 out of 5 by MS Automotive from Impressed Wasn't sure about running that weight, but once we ran that night, we picked up E.T. and MPH. Oil pressure was normal through out the day. Will continue to use this oil.